According to CNN rescent report President Barack Obama and fellow leaders at the Group of Eight meeting he hosted Saturday put job creation and economic growth at the top of their to-do list. “(They) must be our top priority. 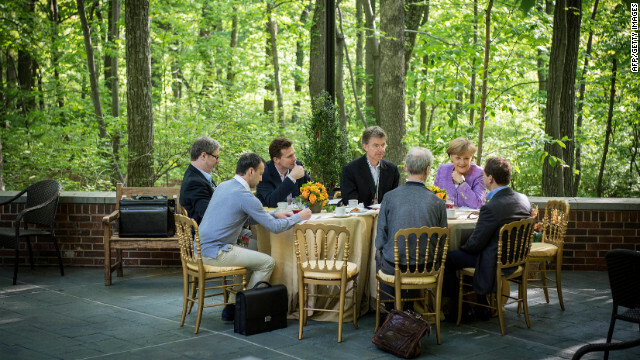 A stable growing European economy is in everybody’s best interest, including the United States’,” Obama told reporters after the two-day Camp David retreat in Maryland concluded. 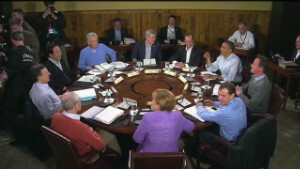 The G8 meeting was one of two high-stakes, back-to-back weekend summits scheduled over the weekend. On Sunday, NATO kicks off its two-day summit in Chicago, with a focus on the Afghanistan ,Syria and Iran. Authorities announced Saturday that three people were charged with planning violent attacks during the Chicago summit. The men, termed “self-proclaimed anarchists” by authorities, allegedly conspired to attack Obama’s Chicago campaign headquarters, the Chicago mayor’s home and police stations, authorities said. An Illinois judge set bail at $1.5 million for each of the three suspects arrested Wednesday. Summit protesters, including those affiliated with Occupy Chicago, held rallies Saturday. 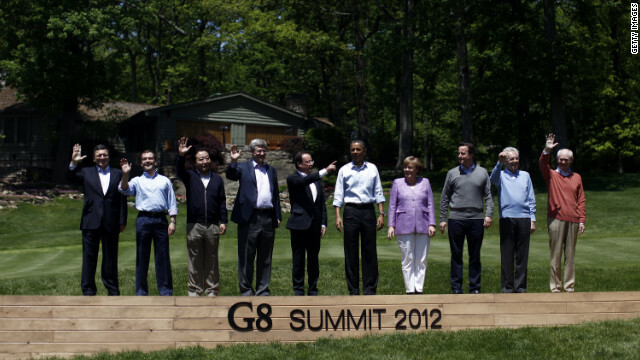 G8 leaders — from the United States, France, the United Kingdom, Germany, Japan, Italy, Canada and Russia — issued a declaration detailing their commitment to ensuring adequate energy and dealing with climate change; providing food security and nutrition in Africa; promoting democratic transitions in the Middle East; and supporting political transition in Syria. They reiterated “grave concern” over Iran’s nuclear program and the need to ensure an adequate oil supply. But it was the global economy dominated that dominated the Camp David sessions. The group dealt with an economically weakened, debt-laden Europe and faced the questions of whether massive deficit cuts trumpeted by German Chancellor Angela Merkel or economic stimulus will help the continent grow its way out of the current crisis. The language in their declaration Saturday appeared to focus as much on growth as austerity. 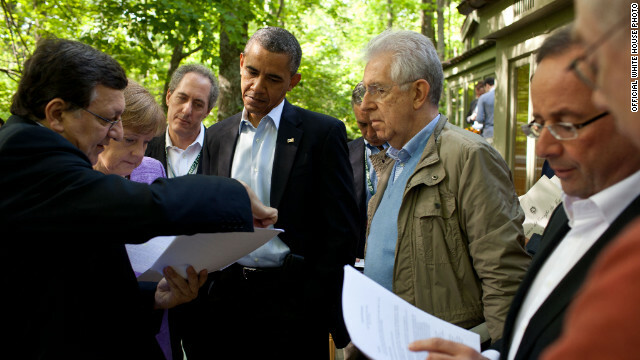 While discussing economic challenges and progress in the United States, Obama said the eurozone is more complicated. Hanging over the deliberations was the fate of Greece, which has been unable to form an elected government. Many analysts believe that Athens will be forced to exit the eurozone shortly, dropping the euro currency and possibly further rattling economic confidence. “We welcome the ongoing discussion in Europe on how to generate growth, while maintaining a firm commitment to implement fiscal consolidation to be assessed on a structural basis,” the leaders said in a statement. The group also addressed the effects of sanctions on Iran over its nuclear ambitions. Iran says it wants nuclear power for peaceful purposes, but world powers fear that it is working to develop nuclear weaponry. Tough sanctions on Iran are slated to take effect June 28, and a full embargo of Iranian oil by the European Union is set for July 1. There is concern about whether a sufficient supply of oil and oil products from other countries will make up for a lack of Iranian oil. “There have been increasing disruptions in the supply of oil to the global market over the past several months, which pose a substantial risk to global economic growth. In response, major producers have increased their output while drawing prudently on excess capacity,” the G8 leaders said in a statement. They said they stood ready to call upon the International Energy Agency to take appropriate action to ensure that the market is fully and timely supplied. Mike Froman, a White House national security adviser for international economic affairs, said the atmosphere at the summit was congenial and there was “very good interaction” among European leaders. No one was defensive as the leaders shared their perspectives on the need to deal with debt and deficits and the importance of promoting economic growth. That included Merkel, a proponent of tough austerity measures, and newly elected French President Francois Hollande, who has different views on austerity and growth. There was agreement among the leaders that North Korea faces further isolation if it continues its pursuit of a nuclear program. The world leaders support U.N. and Arab League envoy Kofi Annan’s six-point peace plan to end the 14-month crisis in Syria, an initiative that calls for a cease-fire. While all of the nations back the Annan plan at the U.N. Security Council, there have been differences between Russia and China and other nations on how to tackle the crisis in Syria. The United States and other countries have urged Syrian President Bashar al-Assad to step aside and have initiated tough sanctions against the government. Russia and China’s stated position is to call for an end to violence, but through diplomacy and negotiation, not official sanctions. Earlier Saturday, Obama said leaders are hopeful about the dramatic political transition in Myanmar, also known as Burma. A few hundred activists with ties to Ethiopia protested the invitation of Prime Minister Meles Zenawi to the G8 summit. They rallied in Thurmont, the town nearest Camp David. They decried Zenawi’s rule as authoritarian. An Ethiopian journalist Ababa Gelaw affronted and intercepted the speech of the African dictator. On Sunday, the war in Afghanistan is expected to dominate discussions at the NATO summit. Afghan President Hamid Karzai and Pakistani President Asif Zardari are both expected to attend the meeting. NATO leaders are currently on a timetable to withdraw all of the alliance’s combat troops from Afghanistan in 2014. Senior administration officials tell CNN that NATO members have tentatively agreed on a security transition plan from NATO’s International Security Assistance Force to the Afghan National Security Forces before 2014. The plan, which also lays out a NATO training and advisory role after 2014, is expected to be formally adopted at the summit. One of the key issues to be discussed in Chicago is who will pay to build up Afghan security forces during and after the NATO drawdown. Afghan national security forces should total around 350,000 by 2015, according to CNN National Security Analyst Peter Bergen. Karzai’s government can afford to cover only a fraction of the cost, which is expected to total roughly $4 billion annually after 2014, Bergen notes. Non-U.S. ISAF countries are being asked to come up with $1.3 billion, the officials said. Another issue is Islamabad’s continued blockade of much-needed NATO supplies over Pakistani roads to Afghanistan. Pakistan has kept its airspace open but closed its ground routes after the death of about two dozen Pakistani soldiers in November at the hands of NATO forces at a post on the Afghan-Pakistan border. NATO insists that the incident was an accident. Negotiations on the issue continue, the senior administration officials said.